Volatility Ticks Up, Are Good Times Ahead? In the June 15th Crypto Trader Digest, I presented a time series analysis of 30 day realised Bitcoin volatility since 2010. 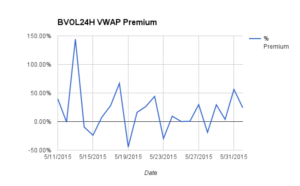 I defined a low volatility phase, as a period of time when the 30 day volatility was below 45% annualised. 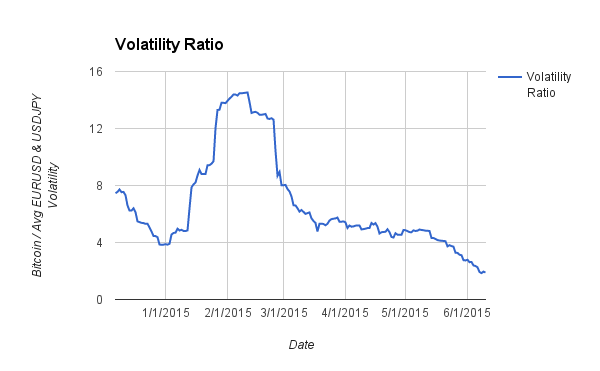 2015’s low volatility phase began in the middle of April, and reached it’s nadir June 13th at 19.08%. Current 30 day volatility stands at 31.95%, a 67% increase. September is only 2 months away. Using past trading behaviour as a guide, price action will increase to take us out of the low volatility phase by early fall. Since the $150-$170 crash in January, Bitcoin has local bottomed in the $210-$220 range on 4 separate occasions. Sub $200 Bitcoin while anticipated by many bears, might just never come to pass again. After 18 months of winter, a volatility median reversion to 74% is more likely to lead to substantially higher prices. The $300 upside resistance level, could fall quicker than many expect and unleash a wave of FOMO buying across the crypto-currency complex. 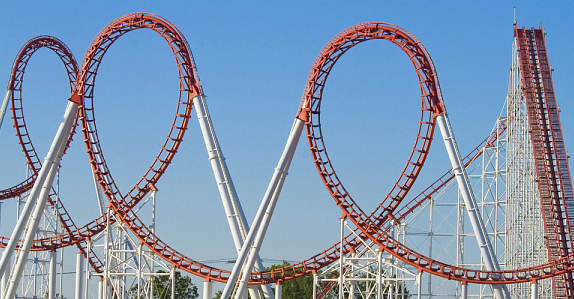 The last few months have been very frustrating for traders. The relentless decline in price volatility has almost transformed Bitcoin into a regular currency. The charts above show the realised 30 day volatility for XBTUSD (Bitcoin), EURUSD, and USDJPY. EURUSD and USDJPY are two of the most traded currencies globally. They are the most “mature” currency pairs one can trade. The Volatility Ratio is constructed by dividing the 30d realised volatility of Bitcoin by the average of the EURUSD and USDJPY 30d realised volatilities. During the price collapse at the beginning of the year, the ratio reached its highest value of 14.53x. 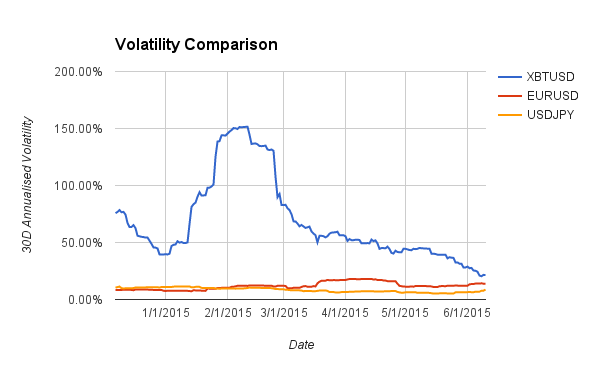 Currently Bitcoin volatility has compressed significantly and the ratio now stands at 1.89x. Has Bitcoin crossed the chasm from a pure speculative magic internet currency to a “stable” currency? No. Bitcoin still lacks many of the facets of global major currency. Local currency debt market? No. Liquid spot and derivatives market? No. Used in every day transactions? No. Volatility will return in a large way, because Bitcoin is still a very speculative currency, commodity, or store of value (take your pick). This lull in trading activity and volatility presents an great opportunity for traders establishing long positions. Bitcoin is a long dated call option. It will either by worth nothing, or a lot. An option is most valuable when the volatility of the underlying asset is the highest. Bitcoin volatility has taken a nose dive, and so has the price. For long term terms (5 year trade horizon, and can stomach a >50% mark to market loss), the current price to volatility situation presents an optimal buying opportunity. Timing the bottom is a fools errand, if you have a long term vision whether you buy and the price drops 20% or more is irrelevant. You are gunning for a 5x, 10x, or beyond return. With that in mind, accumulating long dated futures contracts is a prudent strategy. As Bitcoin volatility normalises, USD swap rates will begin rising. With higher volatility, speculators will re-enter the market and push USD swap rates higher. The risk / reward for leveraged longs is always better than leveraged shorts. USD to Bitcoin rate differential will widen, and longer dated futures contracts will become more expensive. The BitMEX 25 December 2015 Bitcoin / USD futures contract, XBUZ15, trades at a minimum premium to spot. Long term traders who want to take advantage of the low volatility and price should buy this futures contract. Over a month ago, BitMEX launched the world’s first daily Bitcoin volatility futures contract BVOL24H. BVOL24H allows speculation on the daily historical volatility by observing the log price move between prices at 5 minute intervals on Bitfinex. Trading this contract allows traders to profit on their view on the intensity of price movements in a 24 hour period. The daily volatility is very volatile itself. A sudden flurry of trading activity causes the price of BVOL24H to spike. Because upside gains can be enormous, buying volatility is a popular strategy with speculators. However, for a trade to happen someone needs to sell that volatility. Faced with unlimited downside and limited upside, sellers of BVOL24H will demand a time value premium over the expected future volatility. 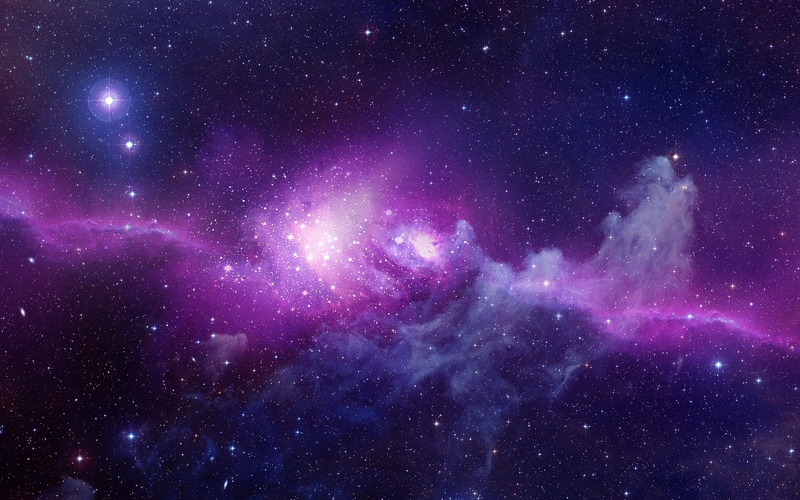 Each 5 minutes, more observations are known and there is less uncertainty about where BVOL24H will settle. As a result, BVOL24H sellers get bolder as the day progresses. To purchase their volatility lottery ticket, buyers are paying 18.13% on average. Sellers are doing a good job as their max drawdown or loss was “only” 44.52% vs. a max gain of 144.18%. Looking at the data so far, traders should feel more comfortable selling BVOL24H as buyers are willing to pay a high price for long volatility. Today was relatively quiet with $270-$276 range bound trading. The $270 purgatory will be shattered soon either on the upside or downside. At the present moment there doesn’t seem to be a robust case for either direction, so better to sit back and wait for the market to speak. 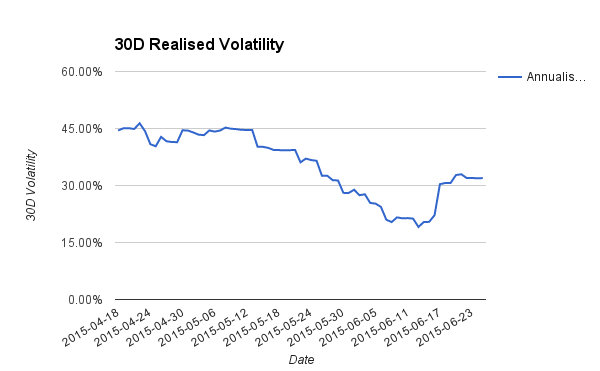 30 day realised volatility has fallen off a cliff since the beginning of 2015. If you believe big up or down moves are ahead in March, consider buying BVOLH15 to profit from a spike in realised volatility. BitMEX launched the world’s first Bitcoin historical volatility futures contract called BVOLG15. The contract settles at the BitMEX 30 Day Historical Volatility Index (.BVOL Index) price. This post will serve as a postmortem describing the trading behavior of the first contract, and hopefully further educate traders as to how they can incorporate BitMEX volatility futures contracts into their portfolios. .BVOL Index measures the annualised standard deviation of the % move between Time Weighted Average Price (TWAP) calculations done on Bitfinex every day from 10:00 GMT to 12:00 GMT. Because .BVOL Index comprises 30 days of price changes, there must be a total of 31 price increments. 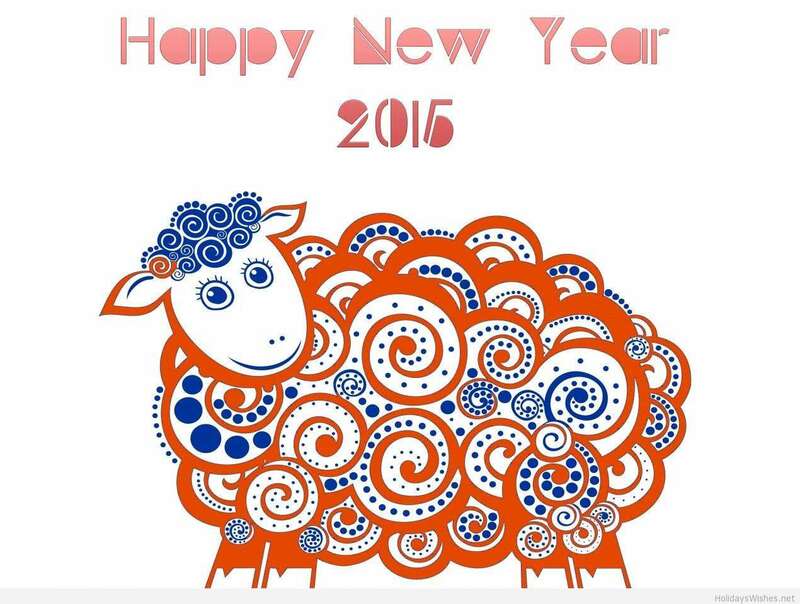 For BVOLG15, that meant the observation period lasted from 27 January 2015 to 27 February 2015 inclusive. BVOLG15 was listed on 5 January 2015, meaning for three weeks traders were placing bets purely on their expectations of future realised volatility. 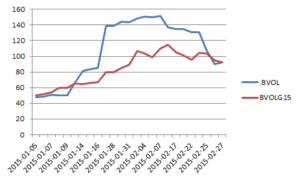 Each day after 27 January 2015, a clearer picture was formed as to where 30 day volatility would realise by expiry. The above graph shows a comparison of .BVOL Index and BVOLG15. BVOLG15 performed as expected. If there are N days until expiry, BVOLG15’s price is composed of N days of realised volatility expectations and (30 – N) days of realised volatility. Even as .BVOL spiked above 150% realised volatility, BVOLG15 did not rise to the same degree because the market did not expect that level of volatility to persist in the future. This is also evident in the volatility of volatility for both .BVOL Index and BVOLG15. 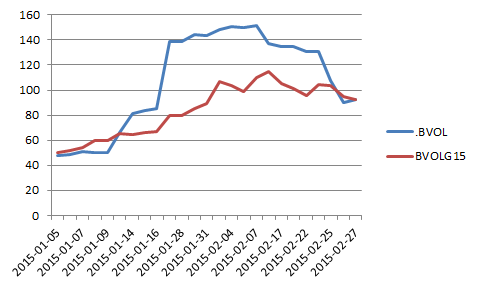 The annualised volatility of .BVOL Index and BVOLG15 was 260% and 140% respectively. Traders who believe they can accurately forecast realised volatility should utilise BVOL futures contracts. Intra-month they discount future realised volatility effectively. Traders need not hold until expiry, but can effectively move in and out of positions as expectations of future realised volatility changes. This is a link to an Excel spreadsheet showing the .BVOL and BVOLG15 data that was used in the calculations and graph presented in this post. All is quiet ahead of the return of the Chinese traders after the lunar new year holiday. A very quiet day with the price flirting around the $240 level. Trading volumes should begin to pick up tomorrow morning Asia time. 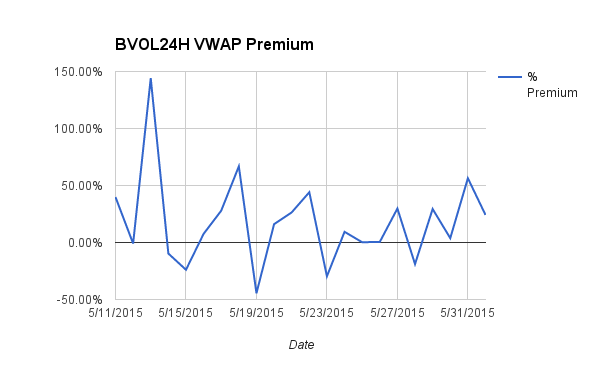 In anticipation of the return of price volatility, buy BVOLH15 (the historical volatility future expiring in March). 30 day realised volatility could climb back above 150% if January’s gyrations are repeated. We are proud to announce the launch of the world’s first Bitcoin 30 Day Historical Volatility Futures Contract (BVOL). The product will allow traders to speculate on the 30 day historical volatility of Bitcoin / USD as observed on Bitfinex. Traders will now be able to profit on the increase or decrease of Bitcoin price volatility without taking a position in the exchange rate. Wikipedia defines volatility as, “a measure for variation of price of a financial instrument over time. Historic volatility is derived from time series of past market prices.” BitMEX has constructed a 30 day historical volatility index by taking the daily 10:00 GMT – 12:00 GMT 1 minute Time Weighted Average Price (TWAP) for Bitcoin / USD on Bitfinex. Each daily index value represents the realised volatility over the past 30 days. The futures contract on settlement day will equal the index value on that day. The futures contracts have the symbol BVOL and expire on the last Friday of every calendar month at 12:00 GMT. The contract is quoted in annualised volatility % points. A futures price of 50.00 corresponds to an annualised volatility of 50.00%. For each 1% point movement, traders stand to make or lose 0.01 Bitcoin. The futures contracts will be margined the same as all other BitMEX futures contracts. Initially up to 5x leverage will be allowed on this product. Margin, profit, and loss are all denominated in Bitcoin. As the liquidity grows, we will gradually increase leverage on this product.